In the east part of Central Lampung there is a nature reserve named ““ which covers 130.000 hectares areas. To achieve , an asphalted road is built. It takes 2 hours drive from Bandar Lampung. In nature reserve, there is the first elephant-training centre in Indonesia to train wild elephants which are capture from outside the area because they have disturbed the people’s fields. 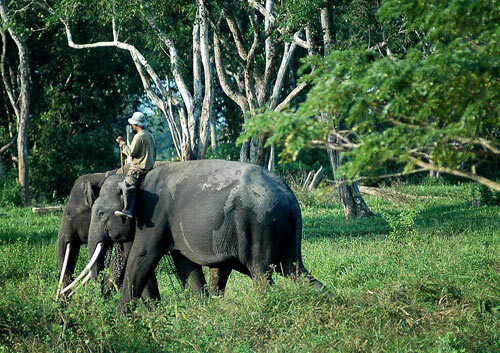 It is estimated there are about 500 elephants in Lampung, 250 of them are in . In this nature reserve, we can also find other wild animal such as Sumateran tigers, bears, tapirs and other animals such as deer, wild pigs and 286 bird species. If we visit Way kambas, we can see the process of training wild elephants in the elephants training centre, an attraction of elephants are playing football, elephant safari, elephants are swimming and on certain occasions, we can also join catching the wild elephants and watch the elephants which are in the sexual mood which is very rarely found in the world. According to Zoography, area included in oriental region. It is different than islands eastside of the Wallace line, either Sumatra or does not have endemic species treasures. There is just 15 species of endemic mammals and 20 species of bird. The existing animals in such as Sumateran Elephant, Sumateran rhino, Sumateran tiger, tapir, chevrotain, long tail apes, monkeys and several kind of bird like heron, parrot, and some else. National Park is the area of raining forest that has 126.000 ha areas. And geographically is located between 4° 37 LS – 5° 16 LU and 105°54 BT, and the highest by 0 – 60 m dpl and the average of raindrops is about 2000 mm/year.